A very unique type of cat, is the Peterbald Cat Breed. This cat looks like what the name infers, a bald hairless cat. However, upon close examination, you will see very fine and short hair. The Peterbald cat, is unlike many other breeds, truly loving people, and will very much be a part of your family. History of the Peterbald Cat. Where did they come from? The Peterbald cat breed came from a unique experimental breeding in Russia (St. Petersburg). In 1994, Olga S. Mironova bred a male Don hairless, or Don Sphynx, with a female Oriental shorthair, and the first four Peterbald kittens were born. So, this is a relatively new breed of cat. Three years later, in 1997, this type of cat was classified as a breed of its own by The International Cat Association (TICA) and only in 2003 it was placed in the World Cat Federation (WCF) with the abbreviation of PBD. In 2009 it was accepted for entrance into Championship class competition and this breed became a very popular breed. A Peterbald Cat is a very unique cat. First, as the name implies, they have hair loss genes, and tend to have either short hair or no hair at all. Second, they have slenderness and gracefulness of the Oriental cat breed which Sphynx cat breed doesn’t have. Peterbalds have triangular shaped heads with long face and long nose, huge wide apart bat-like ears, almond-shaped eyes, long legs and tails, slender and muscular body. Its coat, or better to say, the skin has variety of colors. They can weigh from 7-14 pounds (3-6 kg). The uniqueness of the Peterbald is, moreover, in its lifespan, it is shorter than in most feline breeds: Peterbalds live from 10 to 15 years. The Peterbald is also known for its oval, and webbed shaped paws. It enables them to maneuver toys, and, with much determination, they can jump up and open doors, making them escape artists. You may have to buy childproof door handles to keep your kitty safe. Despite the fact that both breeds are hairless, the genetic reasons of that are different. The Peterbald’s “hairless” gene is a dominant gene, whereas the Sphynx’s gene is a recessive gene. They have a completely different look too. 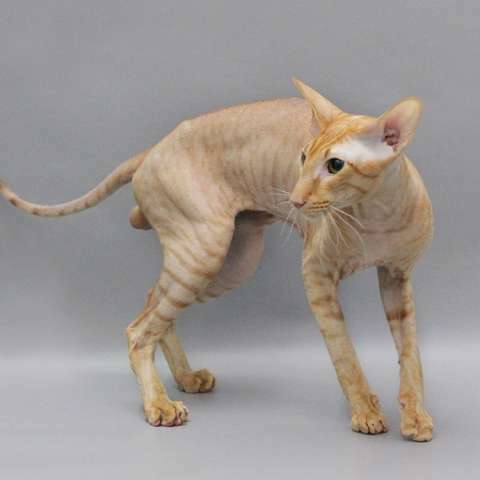 Sphynx feel like warm peaches or chamois, Peterbalds can have a variety of coats from sticky bald to a brush coat. Peterbald’s body type is refined and elegant with elongated face and almond shaped eyes, the Sphynx is pear shaped medium sized cat with a much shorter, wider face and lemon-shaped eyes. 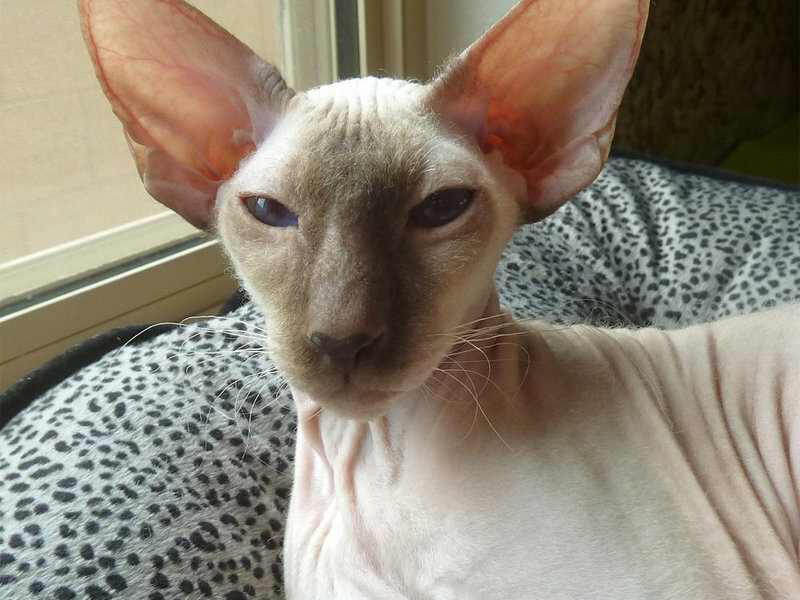 The Peterbald’s ear set is lower than on Sphynx. 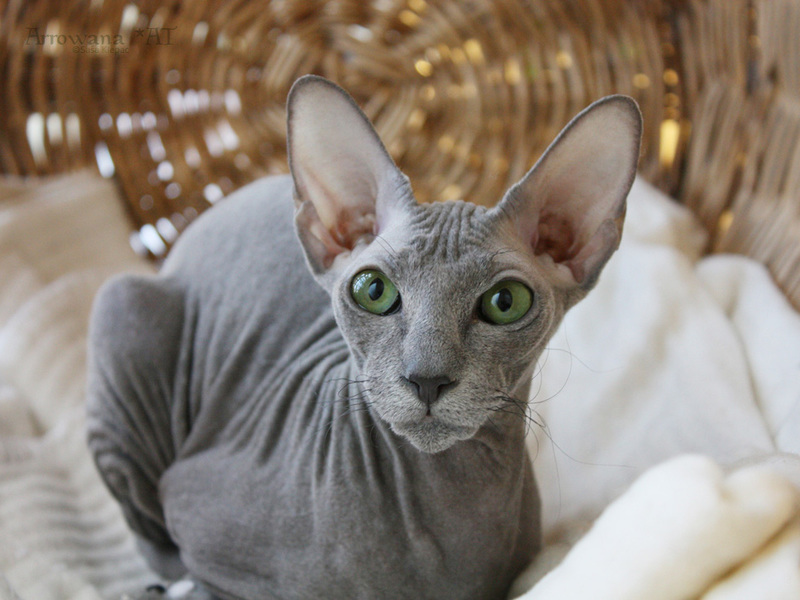 Many Peterbalds have curly whiskers, Sphynx cats are usually have none or have broken whiskers. Bald, as implied. No hair, whatsoever, not even whickers, or eyebrows, and can seem sticky to the touch. This type of cat never grows hair, but can have a small degree of hair on the points (tail, ears, feet). Some kittens can born with curly hair and then become very bald with the time. Chamois, or Flock: so named for Chamois leather, as it feels like this. It is 90% hairless version. Velour: is the 70% hairless breed, with just the slightest bit of hair, about 1mm, and feels just like velour, hence the name. Brush coat: has short hair, about 5mm, and is a bit wiry and curly. The hair feels like felt. You can pet them in either direction, and it will feel the same. The brush coat breed is unique, and only seen in this one variety of any cat known. Straight: This one closely resembles its ancestor the sphinx since it is the only one of the breed that has a short luxurious coat of hair. The straight coat, has short hair, and whiskers as well. There is no hair loss gene in this variety. The Peterbald is very gentle in nature. These cats love their humans and will stick by your side constantly. They crave attention and love to play all day. A Peterbald also loves to “talk” to you. They have very unique sounds. Sometimes they hiss like a snake, and other times they have a wild animal sound like a tiger growl. They are extremely fun to be around. The Peterbald also is great around other animals including other breeds of a cat as well. As for its nature, in general, it is quite loving and wants to be loved. It absolutely loves attention and enjoys the pampering. They are virtually maintenance free, as you do not need to bathe them as often due to their very short hair. However, because of this, these cats get cold very easily and must kept indoors, where it is warm and cozy. This breed of cats is very vulnerable to temperature extremes, so you have to keep your little friend warm every time to avoid any health issues. Peterbalds also need sunscreen if you are going to expose them to the sun outdoors because they have no fur to protect them from the sun. As for feeding this breed tends to be quite active which means that its metabolism burns quite a bit of fuel so the Peterbald cat may need to be fed more than other feline breeds. How much does a Peterbald Cat cost? Why do they cost that much? The Peterbald cat breed is a highly sought out breed in the U.K. This greatly increased the cost of the particular breed. Everyone loves them because of their unique features and relatively ease of care. Prices start at about $1000 (American dollar) and can go quite a bit higher. It all depends on the breeder and the unique qualities of the particular type of Peterbald cat. If you are looking for a one of a kind cat, or even just one that will unconditionally love you, this is the breed. Please note that if you suffer from allergies, these cats are not hypoallergenic, so you may not be able to get one, even though they don’t have much hair. Try to find one to check yourself before acquiring your own new feline friend, or consult with your doctor. Good luck, and enjoy!